So here’s another one for you. Sources are claiming that this could be the Samsung Galaxy S III. We have been getting tons of rumours and leaks every day, and we suppose they aren’t going to stop until the smartphone launches. 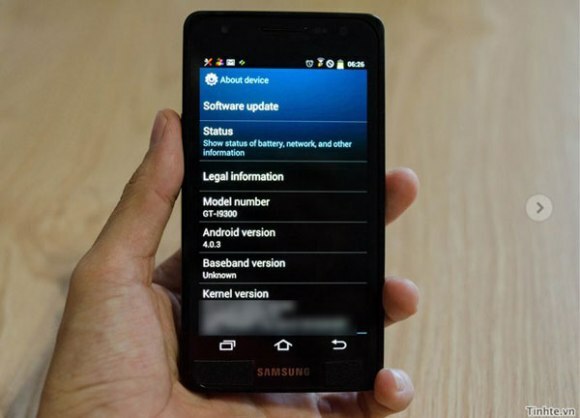 This image comes from Vietnam which is running Android ICS 4.0.3 and does not seem to have any physical Android buttons. The specs are said to include a 1.4 GHz quad-core processor with 1GB RAM, a 4.6 inch display with 720×1184 resolution, an 8-megapixel camera, 16GB onboard storage with a microSD card slot. The source also claims that it will have a 2,050mAh battery and will also have NFC capabilities. The smartphone has the model number GT-i9300 which has been doing rounds for some time now. So could this really be the real deal? Well, we’ll have to wait and see.